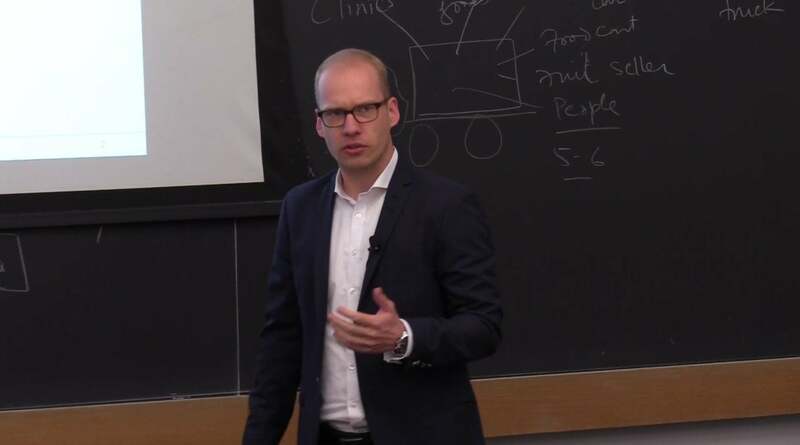 On September 25, 2018, Matthias Breuer, Assistant Professor of Business in Accounting, presented Trickle-Round Signals: When Low Status is Mixed with High. The presentation was part of the Program for Financial Studies’ No Free Lunch Seminar Series. And so I'll be presenting a paper on the Market wide effects of financial reporting regulation today and the regulation of firms financial reporting is quite pervasive. And a crucial part of corporate regulation usually thought of as important to generating and ensuring corporate transparency. In the U.S. for example the FCC requires publicly listed firms to produce and publicly disclose audited financial statements in Europe and other parts of the world even private firms have to publicly disclose some audited financial statements. They call them aggression. Behind these widespread regulation is typically that there are some market wide externalities to these reporting which may lead some firms to privately provide too little of the public disclosure and auditing. Because for one you can imagine that firms don't take into account that their disclosures help others to evaluate their peers. So that's next anality they don't take into account and often firms are reluctant to disclose their financial statements because they have some proprietary information in it which their competitors could use at their expense. And so firms themselves don't want to disclose. But if you're looking at it not from a private perspective of the firm but at the market level it may actually be good to share that information. So one firm's private information cost of proprietary information costs may actually be another once proprietary information gained. So it's not clear that you would want to withhold the information there from a social perspective. Interestingly however while a key argument for regulation is at the market level and its broader effects here we have very little evidence on the Market wide effects of financial reporting regulation in particular. Most prior studies usually focused on the firm level where they are comparing regulated with unregulated firms. But this kind of comparison by its very nature neglects any of these externalities which you would have accruing at the market level. So what you really want to have is a market level design where you rather compare a more or less regulated industry and see how that effects than at the market level at the industry level for example the resource allocation. That's precisely what I'm doing in this paper. In particular I'm investigating how forcing a greater share of firms in an industry to either publicly disclose a full set of financial statements or to obtain a financial statement or how that affects the way in which resources are allocated and the efficiency of this allocation in the entire industry. So not just among the subset of regulated firms. To clarify a bit here why am I looking at the industry level now. Well that's my attempt to get it away from the firm level than one step closer to two relevant market. Why do I think the industry level is relevant markets definition while most of the spillovers we would expect to occur within a given industry because one firm's disclosures is useful to evaluating its peers in the same industry. Not so much to evaluate other firms necessarily and similarly within industry. Competition usually will benefit most from each other's disclosures. Now why am I differentiating here the way and the efficiency of the resource allocation. Well these are a bit distinct and so far as we have a clear sense of prediction what would happen if we force more firms to publicly disclose financial information and to have this hardened so that more reliable huge audit. We would always expect that they should use this information in cemeteries and everyone can now just rely on this public information. So you don't have to have private channels with firms anymore and everything becomes more market like more dispersed rather than concentrated and reliant on private information. This shift from a relational to a transactional type of location however is not clear that this is associated with an improvement in the efficiency of the overall resource allocation. So that's then in the end an empirical question which I'll try to tackle in this paper to investigate this question empirically I turn to the Financial Reporting regulation in Europe. This regulation mandates the reporting and auditing or financial statements of both publicly listed and in particular Private Limited Liability firms. These firms must typically prepare and publicly disclose a full set of audited financial statements exemptions from these reporting and auditing requirements are granted to.